The Old Vic is one of the best known and best loved theatres in the world, synonymous with the greatest acting talent that Britain has ever produced from Laurence Olivier, Peggy Ashcroft, John Gielgud and Ralph Richardson to Judi Dench, Maggie Smith, Albert Finney, and Peter O'Toole. This iconic 192-year-old building has a rich history of great performances and The Old Vic Theatre Company under the artistic leadership of Kevin Spacey, continues to attract the best creative talent from the UK and all over the world to tread its famous boards. The Old Vic is a theatre located just south-east of Waterloo Station in London on the corner of The Cut and Waterloo Road. Established in 1818 as the Royal Coburg Theatre, it was taken over by Emma Cons in 1880 when it was known formally as the Royal Victoria Hall. In 1898, a niece of Cons, Lilian Baylis assumed management and began a series of Shakespeare productions in 1914. The building was damaged in 1940 during air raids and it became a Grade II listed building in 1951 after it reopened. It was also the name of a repertory company that was based at the theatre. The company formed the core of the National Theatre of Great Britain on its formation in 1963, under Laurence Olivier. The National Theatre remained at the Old Vic until new premises were constructed on the South Bank, opening in 1976. It underwent complete refurbishment in 1985 and in 2003, American actor Kevin Spacey was appointed as new artistic director of the Old Vic Theatre Company which received considerable media attention. The nearest underground station is Waterloo, served by the Bakerloo, Northern, Waterloo & City and Jubilee lines. The Old Vic is less than a 10 minute walk away from London Waterloo Station. The venue is in central London so it is advised to use public transport where possible. The Old Vic, The Cut, London, SE1 8NB. You can get buses 1, 4, 26, 68, 76, 77, 149, 168, 171, 176, 188, 341, 501, 505, P11 and D1. There is pay and display parking on Waterloo Road, Webber Street and The Cut (road). There are three NCP car parks within a five minute walk of the Theatre - at Waterloo Station/Station Approach, Cornwall Road and Doon Street. There are four steps from the street into the foyer and box office. Handrails are available on either side of the entrance. From the foyer there are three steps into the Stalls (without handrails). 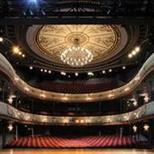 There are 29 steps to the Dress Circle and a further 20 steps to the Baylis Circle. There is a space for wheelchair users in the Stalls. Please contact the venue for information and bookings on 0844 871 7628. Please let the box office know if you'd like to bring your guide dog into the auditorium and they will try and offer an aisle seat if available. They will also advise you of any special effects in the production that might affect your dog's comfort. The Front of House staff will be happy to take care of your dog during the performance if you would prefer. For all access information and to book, please call the venue on 0844 871 7628. There is a disabled parking bay available on Webber Street. For further information please contact Lambeth Council.